Four Treasures of the Chinese Calligraphy Study (wén fáng sì bǎo 文房四宝 ) is an expression used to refer to the ink brush, inkstick, paper and inkstone used in Chinese calligraphy. The name stems from the time of the Southern and Northern Dynasties (nán běi cháo 南北朝). The brush pen was invented very early in China's history. Brush pen use can date to at least three thousand years ago. The construction of brushes are adapted to a specific purpose such as painting or calligraphy and desired effect to be achieved such as clearly defined characters or blurred ones. And unlike conventional pens with a metal point, a brush pen is made from fine, soft animal hair. The resulting flexibility of the point of the brush pen is perhaps its most unique feature. A brush pen can be manipulated not only to the left and right on a two-dimensional plane, but can also be raised up and down, creating lines of varying thicknesses and endless variations. 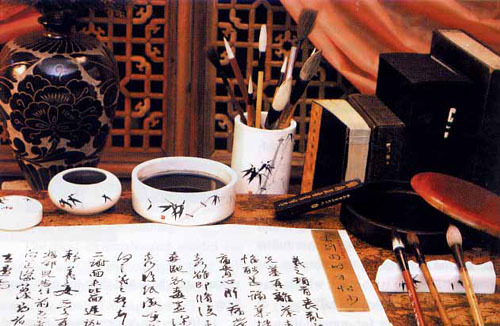 Many aspects of Chinese painting and calligraphy developed due to the special characteristics of the brush pen. The brush pens are classified by the type of hair used: goat hair (yáng háo 羊毫), wolf hair (láng háo 狼毫), and purple hair (zǐ háo 紫毫). Wolf hair brushes are actually made from weasel hair and purple hair brushes from rabbit hair. Goat hair brushes are soft, flexible, and absorbent. Purple hair brushes produce bold lines and are best suited to calligraphy. Sometimes, to achieve a balance between steely and feathery lines, a brush that combines hair from two different types of animals is used. Not only is the handle made from bamboo, wood, lacquer, and porcelain, but also from precious materials including mother-of-pearl inlay, ivory, and jade. Usually, painters and calligraphers have several types of brushes on hand to adapt to individual purposes and preferences. 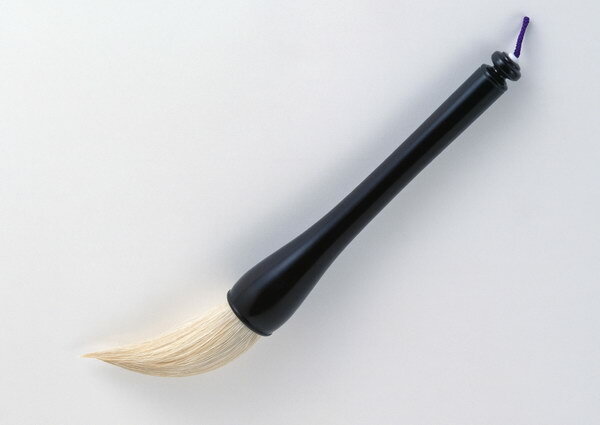 The Chinese brush may be big or small, stiff or soft. The important thing is that it serve your own practical purpose. Generally, a big, soft brush is used to write large characters and a small, stiff one to write small characters. The point must be "round like an awl (zuàn 钻)" that can be "pressed like a chisel (záo zi 凿子)". The Chinese brush point should have the following characteristics: roundness, pointedness, evenness and strength. Roundness means the point should be rounded and robust. Pointed-ness means it should be as sharp or pointed as an awl. Evenness means that when you spread the brush and hold it down, the brush is even. Strength means the point is flexible or elastic. You can moisten a new brush in your mouth, then press it forward and backward on your thumb. The brush will go round and round smoothly. When you pick the brush up, it will return to its former shape naturally becoming as sharp and pointed as before. This means your brush is all right. Four Treasures of the Study is an expression used to refer to the ink brush, inkstick, paper and inkstone used in Chinese calligraphy. In Korea, it is usually written as "Mun bang sa woo", which means "Four Friends of the Study." Among the various tools of calligraphy, the writing brush is special to China. While brushes are varied, the white goat hair, black rabbit hair and yellow weasel hair brushes are the three major types. On the basis of function, they are classified into three groups: "hard," "soft" and "both." The brush handle can be made of either bamboo, wood, lacquer or porcelain; precious materials, such as a mother-of-pearl inlay, ivory and jade, can also be used. The writing brush has a long history: prehistoric painted pottery, inscriptions on oracle bones, bamboo slips and silks all served as its writing materials. Some ancient writing brushes were excavated in graves of the Spring & Autumn and the Warring States periods (770-221BC) and the Qin and Han dynasties (221BC-AD220). In the Tang and Song dynasties (618-1279), Xuanzhou became the national writing-brush production center where Xuan-bi and Zhuge-bi were of the best quality. After the Yuan Dynasty (1271-1368) the brush-producing industry of Huzhou boomed and Hu-bi replaced Xuan-bi. The Hu-bi was sharp, neat, round and tough. The writing brush is a functional handicraft article peculiar to China, an instrument still used by its pupils in calligraphy and painting exercises. The first writing brush, according to legend, was made by Meng Tian, a general under the First Emperor of Qin (259-210 B.C. ), long time in command of the troops stationed along the Great Wall. Once he happened to see a tuft of sheep's wool stuck on the wall. Taking it down and tying it on a stick, he made the first writing brush. Archaeological finds, however, have given the lie to this story. Traces on the painted pottery unearthed at the ruins of the neolithic site of Banpo Village near Xi'an show that the brush in its crude, primitive form was used 6,000 years ago. But people still called Meng Tian?who may have improved upon the brush?the originator of the writing tool. Shanlian Township in Wuxing County, Zhejiang Province?dubbed the "metropolis of the writing brush"?is also known as Mengxi (Meng's Stream) in memory of Meng Tian. The brushes produced at the township, which used to be under the Huzhou Prefecture in the old days, are called Hubi (Huzhou brushes) and supposed to be the best in the country. The hu brush is made of the hairs of the goat, hare and yellow weasel, all marked by a quality which is at once soft and resilients. Dipped in the black Chinese ink, the hu brush may follow the manoeuvres of the writer's hand to produce a variety of strokes?dark or light, wet and solid or half dry and hollow?for different effects in the writing or painting. First-grade hu brushes must meet four requirements: a sharp tip, neat hair arrangement, rounded shape and great resilience. Their making involves more than 70 steps of careful work. For instance, the preparation of the material alone means that the hairs of a goat or hare must be sorted out into dozens of bunches according to thickness, length, and softness or stiffness. Then hairs of different specifications are used to make different brushes meant for different uses. Now hu brushes are produced in more than 200 varieties. The sticks for the brushes, made from local bamboo of high quality, are often decorated with ivory, horn or redwood; some are mounted at the top with horn or bone for the purposes of inscription. Hu brushes, renowned as "king of writing brushes", used to be supplied to the imperial court. They were also a necessary item on the desks of men of letters or of means. 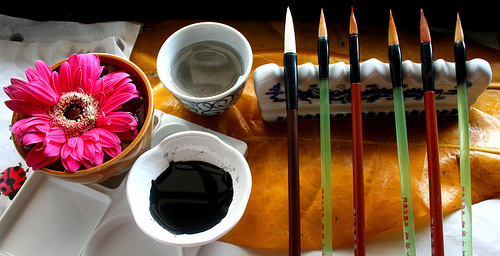 The ink-stick is the pigment of Chinese traditional painting and calligraphy. Initially, natural ink or half-natural ink was generally used. Eventually, artificial ink appeared. The Inkstick is made from a mixture of soot and resin, molded into stick form. The three types of soot most commonly used pine, oil, and lacquer soot. A good inkstick is finely grained and has an even and smooth texture. It is firm and not sticky. It is pure, solid black in color, without murkiness or roughness. A new brush has a sticky coating that must be removed by immersing the brush in warm water (do not use hot water). The hair will then fluff out. Do not try to remove the glue by force. Do not use your teeth to remove the glue. The glue on brushes for writing small characters should be removed from two fifths of the length of the hair. The glue on brushes for writing medium-sized characters should be removed from half the length of the hair, and the glue on brushes for writing big characters should be removed from two thirds the length of the hair. It is not advisable to remove all the glue from the brush. If it is removed entirely, the brush will not have the required force or rigor. How much glue should be removed just depends on the convenience of the user. The brush for writing big characters must be washed in clean water after use. Be sure no ink is left on the brush, which should be carefully groomed. The brush should be hung up with the tip downward. The brush for writing small characters must be put in a sheath after use, to protect it from gluing up. If the brush is not used for a long time, it must be kept in a box or a bag. Camphor balls (zhāng nǎo wán 樟脑丸) should be used to protect the brush from being moth-eaten. 最后修改: 8 年, 8 个月 之前 由 dingpuzhao. Paper is one of the most famous Chinese inventions. It is widely believed that paper was invented by Cai Lun in the Eastern Han Dynasty (25-220). However, archaeologists have discovered paper samples in the Western Han Dynasty (206BC-AD8), such as Fang-ma-tan, Ba-quao, Xuan-quan, Ma-quan-wan, Ju-yan and Han-tan-po paper. After the Eastern Jin Dynasty (317-420), paper was used extensively in lieu of traditional writing materials, such as bamboo slips and silks. And various paper-production methods emerged one after another. In the Tang and Song dynasties, the paper-producing industry was thriving and top-quality products appeared in succession. During the Qing Dyansty (1644-1911) Xuan-zhi, which was produced in Jing Prefecture of Xuanzhou (Anhui Province), became the special paper for painting and calligraphy; it was regarded "the king of paper." Xuan paper is known to some Westerners as "rice paper", which is a misnomer. In fact, it is made from the bark of the wingceltis (Pteroceltis tatarinowli) mixed with rice straw. Its home is Jingxian County, Anhui Province. 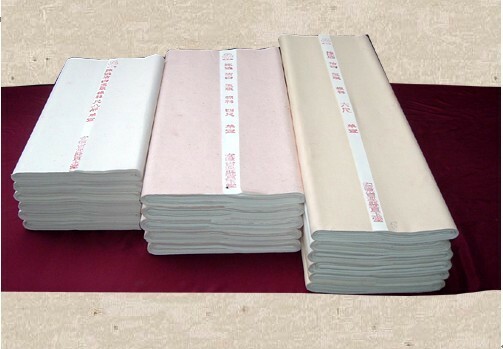 As the county belonged in ancient times to the prefecture of Xuanzhou and the trading centre of the paper was at Xuancheng, so it has always been called xuan paper. The making of xuan paper is a pains-taking procedure involving 18 processes and nearly 100 operations and lasting over 300 days from the selection of materials to the finished product. The xuan paper is praised as the "king of all papers" and is supposed to "last a thousand years". This is because it is white as alabaster, soft and firm, resistant to ageing and worms. It absorbs but does not spread the ink from the brush, which goes over it with a feel neither too smooth nor too rough. For these qualities, the xuan paper is not only used for painting and calligraphy, it is increasingly used nowadays for diplomatic notes, important archives and other documents. In addition, it may also be used for blotting, filtering and moisture-proof purposes. To use the traditional inkstick, an inkstone is required. As the name suggests, most inkstones are made of stone. The stone used must be of relatively fine whetstone (mò shí 磨石) materials so the bristles of the brush pen are not damaged and to facilitate the grinding of the inkstick could. A little water is added to the inkstone, and the inkstick is ground. The result is ink, and the inkstone acts as an inkwell. Inkstones are extremely durable. In ancient times, artisans would have their names or other words engraved on their inkstones to be passed on to future generations. Inkstone is the most important of the "four treasures of study." Because of its solid texture inkstone can be handed down from generation to generation. In the ruins of primitive society, archaeologists discovered simple stone ink slabs that required a pestle to grind pigments. After artificial ink sticks appeared in the Han Dynasty, pestle gradually disappeared. In the Han there were pottery, lacquer and copper ink slabs, as well as stone ink slab. Among the stone ink slabs, the round tripod pieces were most common. During the Wei, Jin and Northern and Southern dynasties (220-581), round tripod porcelain ink slabs were in vogue. It was in the Sui and Tang dynasties (581-907) that Piyong inkstone with circular legs appeared. 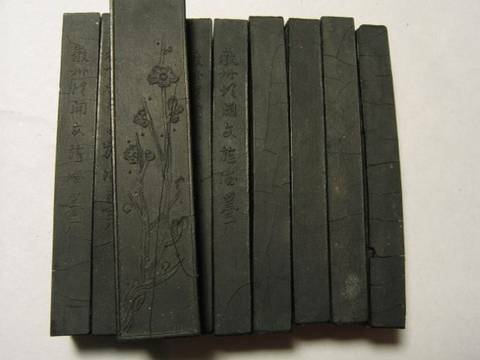 To the fastidious calligrapher, a good inkstone should be made of the stone produced at Duanxi, a suburb east of the city of Zhaoqing(formerly Duanzhou). Guangdong Province. Named after the home of the stone, the duan inkstone has a history of over 1,500 years and has always been regarded as a valuable item in the scholar's study. The stone must go through several painstaking processes before it is turned into the finished slab. These include quarrying, selecting, cutting, polishing and making of the containing box. The most difficult part is the digging-out of the stone, which lies under the Keshan Mountain near Zhaoqing. Quarrymen have to make tunnels at the foot of the mountain, drain them of water and creep in to dig out the right kind of stone all carried out under exacting circumstances. Value: Duan inkstone are valued for their fine and smooth surfaces which look as if glossy with moisture. They make ink fairly fast and wet the hair of the writing brush evenly; they are also good for keeping left-over ink. A well-chosen piece of stone may also bear fine veins, indistinct but pretty to look at. Now let’s talk about the things, or the tools we are gonna use to paint Chinese painting. In Chinese we called those tools as “Wen Fang Si Bao”, literally means the four treasures in your study. These are the brush, we call it “Bi”. And this is of course papers, you can see that. And this piece of stone we call it ink stone or ink slap. The thing is that, this is called “Bi” in Chinese. But of course I see that in English it’s called brush. In western painting, you use a kind of a flat brush, but in Chinese painting or Chinese calligraphy,we use a round one. And in Chinese we call it “Bi”, which sounds very much like or exactly the same as we would call it pen in English. So this is the traditional Chinese pen. And also holding this kind of pen, just like that. And “Mo”, the ink，I know the ink in English is something liquid. But in Chinese, painting a Chinese calligraphy, ink is a piece of something like a rock, it’s a stick, it’s an ink stick. And the ink has to be used together with this piece of stone. This ink stone, or ink slap. And we pour some water into it, and we rub the ink stick, and then we can get the liquid ink we are gonna use in painting and writing. And then can use the brush and dig it into the ink and you get everything ready. And then we need to have paper. This kind of paper we call it “Xuan Zhi” in Chinese. It’s very very strong but soft. And they can absorb liquid of water or ink very quickly. It’s very easy for the artist to use ink to have some special effect they want on this kind of paper. Well, these are the things we are gonna use when we do Chinese traditional painting. 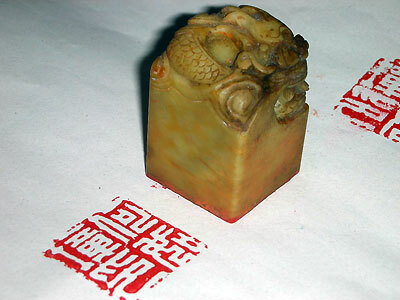 Seal plays an important role in Chinese culture, which has been used for official and private in the last 3,000 years. The earliest example of seal come from the Shang Dynasty (1600 B.C. - 1100 B.C.) ruins at Anyang. According to a Han Dynasty legend, the first seal was given to the Yellow Emperor by a yellow dragon with a chart on its back. The other says that the seal was given to Emperor Yao by a phoenix as Yao was sitting in a boat. In ancient China, the receipt of the seal signifies the conferral of the Mandate of Heaven. He who has the seal possesses the Mandate of Heaven, in other words, he has been given the right to rule the empire. Hence, the seal is regarded as the symbol of power. Seals can be divided into three categories, the imperial seal, the official seals and the private seals according to their usage. Different Dynasties have different styles of their seals, including the inscription, design and so on. The imperial seals: During the Warring States (476B.C.-221B.C. ), there was only one way of calling seals, both official and private, regardless of their usage and material. The name was Xi, which in the following periods gradually became the name of imperial seals. According to the historical records of Tang Dynasty, Empress Wu Zetian changed the name of seal ‘Xi' into ‘Bao', meaning treasure in Chinese, because she disliked the pronunciation of Xi which sounds like death in Chinese. But when Emperor Zhongzong resumed the throne in 705, he changed the name for imperial seals back to Xi. In subsequent centuries, the two words were used alternatively. 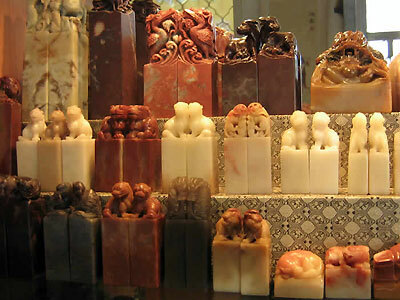 In Han Dynasty, the emperor had six seals. During the Tang Dynasty, the number began eight, during the Ming Dynasty, the emperor had more than a dozen, and by the time of the Qing Dynasty, there were several dozens of official imperial seals. The inscription on these seals usually refers to receiving the Mandate of Heaven or being the successor of Heaven. Another type of imperial seal was the seal the emperor used to issue certain document written in his own handwriting. Emperor Qianlong (1736-1795) in Qing Dynasty, for example, was famous for his literary talent and calligraphy, so he left a large amount of articles and writings affixed with his seal. The Official seals: The official seals were served as a token of office and authority. These seals were usually made small so that the officials could carry on their belts. The seal were made of gold, copper or jade with the handles shaped of turtle, camel and so on. Up to the Eastern Han Dynasty ( 25 A .D. -220A .D. ), the color of ink used to affix official seals was depending on the official ranks of its owner, some used green ink, some purple and some yellow, etc. The calligraphy of the inscription had changed a lot as the civilization advanced. In the Han Dynasty, the characters on the seal are thick and angular. In the Sui Dynasty (581A.D. – 618 A.D.), they became round and thinner, and during the Song and Yuan Dynasties, the spectacular nine-folded script came into being. When it moved on to the Qing Dynasty, most official seals are bilingual with the Chinese inscription on the right side and the Manchu on the left. The private seals: As to the private seals, they show the grate diversities in content, shape, size, material and calligraphy. Despite their differences, the private seals can be divided according to their different usages. Seals with names, pen names and others were used as a signature. This is the way artists sign their works and letters. For many Chinese artists usually used different pen names on their works, identifying the authors from the seal is not that easy. Collector seals were primarily used for authenticating pieces of art masterpieces. Thus, a seal of a famous collector would become an integral part of a work and could substantially raise its value. 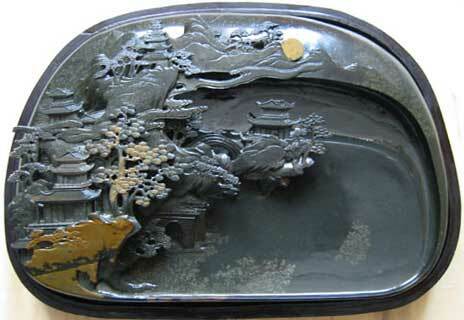 So, one can see some Chinese paintings or calligraphies covered by a dozen of different seals. The rest of private seals can be regarded as leisure seals. The inscriptions on these seals usually quote from a famous writing or saying, which can show the owner's taste.